Alfred Molina, Meredith Baxter, Leslie Caron et al. 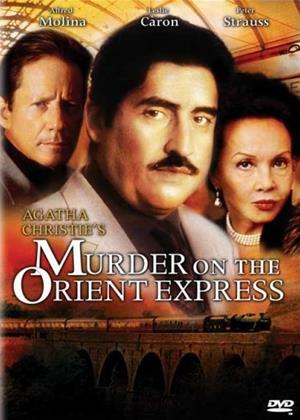 Hercule Poirot (Alfred Molina) is travelling on the Orient Express. While on the journey, Poirot meets a very close friend Bouc (Fritz Wepper), who works for the Compagnie Internationale des Wagons-Lits. The train is stopped when a landslide blocks the line on the second night out from Istanbul, and American millionaire Samuel Edward Ratchett (Peter Strauss) is found stabbed to death the next morning. Since no footprints are visible around the train and the doors to the other cars were locked, it seems that the murderer must still be among the passengers in Ratchett's car. Poirot and Bouc work together to solve the case. They are aided by Pierre Michel (Nicolas Chagrin), the middle-aged French conductor of the car.